Brief Description: Rust colored (orange) powdery substance in spots or entirely coating grass blades, easily brushed off. Lawn rust is an unusual lawn disease that can be easily identified up close when looking at each individual grass blade. 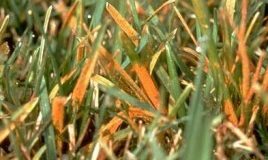 The orange or rust colored fruiting bodies that eventually develop on grass blades as a result of infection by the various types of Lawn Rust fungi help to differentiate it from other lawn diseases. In its powdery form, Lawn Rust is spread easily, by anything from the wind, grass blades brushing against one another and people, animals or even insects walking through it. This disease prefers the shade, but also heat and humidity. Unlike many other fungal lawn diseases, it grows well in soil that is low in nitrogen. Lawn Rust initially looks like small, yellow dots on grass blades, appearing from a distance as lighter patches of normal grass. As the disease develops the light dots lengthen, eventually rupturing and producing the rust colored tufts of powder-like substance that gives the disease its name. Severe Lawn Rust infections will color the entire length of the grass blade and can eventually cause the grass to appear shredded and point downwards rather than standing upright. 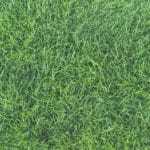 Less severe infections will only cause the grass to grow more slowly, and the lawn to appear discolored. However, any level of infection will make your lawn more likely to attract other lawn diseases while the grass is weakened. Lawn Rust can be prevented by fertilizing the lawn with nitrogen-based fertilizer, and by watering for long periods at long intervals rather than for short periods at short intervals to ensure that the grass continues to grow thickly. 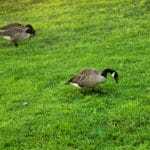 This will help your lawn to fight off diseases and pests that might otherwise take advantage of weakened grass. 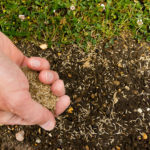 It is always a good idea to aerate the lawn when faced with fungal lawn infections, as many fungi prefer moist, poorly draining soil to grow in. 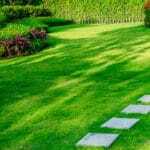 Minimizing the amount of shade your lawn gets will also help to kill off Lawn Rust and prevent it from appearing. Fungicides should be applied to lawns infected with Lawn Rust only in severe cases, before the disease goes into dormancy for the winter. However, Lawn Rust infestations may go away on their own with proper fertilization.